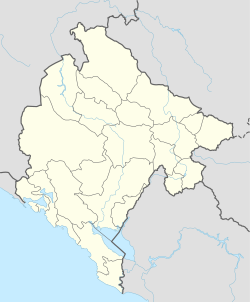 Sutomore (pronounced [sûtɔmɔːrɛ]) (Montenegrin Cyrillic: Сутоморе; Venetian: Spizza) is a small coastal town in Bar Municipality, Montenegro. A 2011 census put the population at 2,004. Sutomore was called Spizza in Venetian, when it was under the Republic of Venice from 1420 to 1797 and belonged to the Albania Veneta, except for short-lived Ottoman occupations. In the 19th century it became the part of the Habsburg Empire and later the Austro-Hungarian Empire. The name of the city was Spitza during that time and it was the most southern settlement of the Empire. The Austrian census of 1910 reports that there were Venetian speaking families in Spizza in the twentieth century. Sutomore is located on the Adriatic Highway (E65/E80), and is connected to Podgorica and inland Montenegro via Sozina tunnel. It is also a stop on the Belgrade–Bar railway. The ease of access, coupled with its beach, has made Sutomore very popular budget destination. However, the sheer number of tourists, combined with informal and spontaneous building boom and lack of urban planning, have contributed to chronic traffic problems. As transit traffic from inland Montenegro to Bar goes straight through the town, traffic jams and crowded streets are a commonplace during the summer months. Sutomore is especially popular with the younger crowd from Serbia and rest of Montenegro, as its beach promenade is lined with numerous bars, cafes, fast food restaurants and nightclubs, while it is more affordable than the 'upscale' resort of Budva. According to the 2011 census, Sutomore has 2,004 inhabitants. Nearby suburbs of Brca (263), Miljevci (340), Papani (175), Zagrađe (364), Zgrade (512) and Zankovići (305) have been listed as separate towns by Montenegrin Statistical Bureau, so the population of Sutomore urban area has close to 4,000 inhabitants. Wikimedia Commons has media related to Sutomore. This page was last edited on 4 January 2019, at 21:03 (UTC).